Welcome to Nanditaʼs Dream, a magical adventure story. 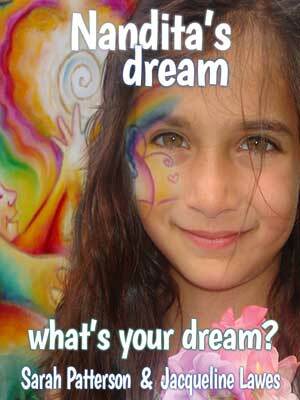 Nandita’s Dream is a story for everyone wanting to trust their heart, sing their song and follow their dreams. It’s a story infused with a love of nature and co-creativity. It blends new, ancient and tribal wisdom to create new dreams in the world. Nandita’s adventure takes her deep into a jungle land by the sea, travelling with the children of The People tribe. Here she swims with dolphins and bravely climbs to the crystal cave above the waterfalls of Watazee to meet the rainbow shaman. Here she makes friends with Joe, the wild 11-year-old drummer who communicates with animals, and Tess, the green girl whose hair is growing twigs and orange blossom – a girl who talks with plants and can blend with trees at will. In fact, there are many great characters: Melody, the indigo-blue woman, sings everything alive, Salassie calls the wind, and Oz, the guardian tree, spreads branches like protective arms over the village in the rainforest. Nandita finds herself among children from all over the world, where different is not just normal but interesting. Now, as she learns about The People tribe’s story of Source, she begins to realise that her question is leading her to a clearer, bigger idea of what she’s doing in the world. She dares to ask, “Does the Earth, Pachamama, have a dream?” The next thing that happens is a surprise to everyone. To find out more about how Nandita finds the answer to her question and what dreams she brings back to the waking world, download Nandita’s Dream.